The Ofi Press Magazine - Kamanda, K.S. Kama Sywor KAMANDA was born in Luebo, Congo in 1952. State diploma in literary humanities, 1968; degree in journalism, Journalism Sch., Kinshasa, Congo, 1969; degree in polit. scs., U. Kinshasa, Congo, 1973; L. philosophy and humanities (honors), U. Kinshasa, Congo, 1975; HD, U. Liège, 1981. This writer's poetry, novels and folk-tales illustrate the dual influences of Ancient Egypt, his Ancestors' Land, and of his rich Bantu ancestry. Ten collections of poetry, in which the celebration of Africa and the anguish of exile and solitude are recurring themes, have earned international recognition. 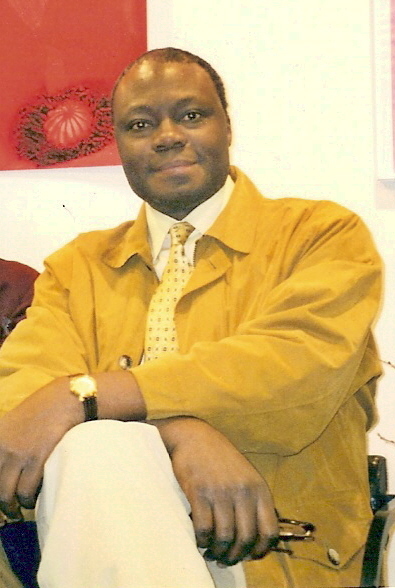 Kamanda's work has been widely translated and appears in international literary journals. He has won numerous literary awards. Interview carried out by Jack Little by email. Published in issue 18. 1. How does ancestry impact upon your writing? The first impact comes from the recognition of our past in order to understand who we are and where we do come from, in order to be able to build up one’s future. Therefore, I have understood the importance of the questioning on the origins for a writer. In a world in which human beings fight against each other for ideas so as to impose on the other their mode of thinking, it is of utmost importance to understand first one’s own identity if one wants to be able to understand the other’s identity. It is the beginning of dialogue, cultures and civilizations. My poetic inspiration expresses part of my ancestry’s inheritance. 2. How has being a writer in exile impacted upon your view of reality? Exile has given me the power to resist to any form of oppression. First of all, exile has given me the opportunity to discover that there are so many fair and nice persons in the world. I have met friendship and love on all five continents. Racism has always been out of the question, because thanks to culture and good education, I have been able to love and respect people whatever be their religion or their skin colour. Secondly, the fact of being so far from Africa has given me the opportunity to have better judgment on the richnesses and poverties of the African continent. 3. What does “love” mean to you? Love is sharing dreams, passions, mutual support, visions, feelings. Love is giving us strength to fight against all odds, in order to make our dreams come true. 4. Has there been a moment that changed your life forever? Please tell us about it. As you can imagine, the day I left Africa for Europe. My exile has lasted for so long, too long. 5. Is there a poem or story that sends shivers up your spine no matter how many times you read it? Yes, when I read « Lointaines sont les rives du destin », my first novel, I feel like if I were back in mystic and mysterious Africa. 6. What does the future hold for Kama Sywor Kamanda? For me, future is to write new books for people who like literature. Later on, I’ll go back to Africa to help my people on their way towards democracy.